Fundamentals of surface contact: surface topography, asperity contact, interfacial phenomena. Friction theories and wear mechanisms. Temperatures in sliding contacts. Hydrodynamic, hydrostatic, elastohydrodynamic and boundary lubrication. Surface failure due to rubbing is a critical problem that affects the life and reliability of modern machinery. Introduction to Tribology is an interdisciplinary course for the tribology in design and manufacturing. The course introduces the nature of engineering surfaces, basic phenomena of interacting surfaces in relative motion, major modes of friction and wear, and popular theories of contact and lubrication. It will also introduce instruments for friction and wear analyses. Design of typical tribological elements and systems will be discussed as well. Surface failure due to rubbing is a critical problem that affects the life and reliability of modern machinery. The knowledge of surface interaction is essential to mechanical and material designs. This course is taken by students from mechanical engineering, civil engineering, and material sciences. Understanding the surface phenomena related to relative motion, the nature of friction, and mechanisms of wear. Studying engineering problems related to friction, wear, and lubrication. Learning basic skills for tribological analyses. Practicing tribological design of mechanical elements and systems. The approach of the course is to integrate theories with student research and design. Theories and principles will be introduced through lectures. Instruments and experimental apparatus for tribology will be introduced through laboratory visits and homework exercises. A research-design project will be assigned. 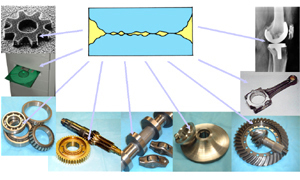 Tribology, Principles and Design Applications, by Arnell et al.